Goodmans' £150 HDTV going, going, gone! If you haven't bought one yet, then you're already way too late. The Goodmans special HDTV / digital set top box bundle we told you about on Friday has completely sold out. Goodmans says it hoped to sell 100 20-inch GTVL20W7HD LCD TVs with free set-top box throughout the day today, but they were all snapped up between 10am and 11am this morning. The special offer bundle was priced at just £150. The normal selling price for the pair is £240. 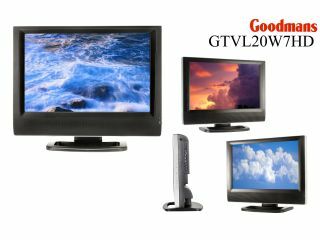 The GTVL20W7HD will be available again tomorrow for its usual selling price of £200. The GDB15HD set-top box is still available for £40.